It’s “Quantum” ‘cause it’s full of superpositions and controversies. 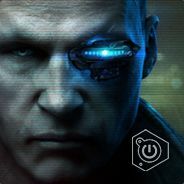 Be more disciplined but roam a lot? Sure. Defenders attacking, strikers defending, midfielders are everywhere? Of course. It’s called in-game “4-1-3-2 DM Narrow”, but it’s actually very wide. You get the pattern. CS stands for “Creeping Suffocation”. Why? ‘Cause it slowly suffocates opponents, restricting them from playing football as much as possible. Even top opponents will often fail to do a single shot on target (sometimes even just shot). Often they’ll enrage and get red cards. I played variations of this tactic for years, from exotic lower divisions to top European leagues and it gave excellent results everywhere. Especially well it does against (undeservedly) popular nowadays 4-2-3-1 and 4-3-3 variations. In general, every tactic with wingers is highly vulnerable. The only tactics which can cause struggle are classic 4-4-2 and its variations (4-1-4-1, 4-4-1-1 etc), but you may never see it during the whole season (in any case, doing right changes will solve the problem). As a top team, it’s easy and boring. Average-promotion-candidate dominating the league. Most games were lost after securing the title (you can see it in the “Form” column). There are some demo matches in “matches” directory. Balance, discipline, possession, fluidity, restricting the opponent as much as possible. Sounds boring enough, but board and supporters will praise you for the attacking football. A key concept is overloading zones 2 & 5 while defending, zones 14 & 17 while attacking and eliminating opponent presence in the middle (zones 8 & 11) by pressing them out to sides. We’ll use flanks occasionally, mostly for crossing and/or stretching defense, but as a whole, it’s a center line strategy. One tactic to cover them all. You don’t need alternative tactics, just do some minor changes. Almost plug-n-play, it works well for top clubs and relegation candidates with minimal tweaking. You don’t need wingers (though you may use them until they’re sold). Graphene-strength defense, you’ll concede mostly flukes. Ideal for “Play attacking football” philosophy (again, quantums of discipline and possession do the magic), but board and supporters will be extremely happy anyway. Can be vulnerable to counter-attacks if you have low-quality center-backs. Heavy rotation is required to keep players alive during the season. Dealing with 4-4-2 may require some extra clicking. Tactics itself looks plain enough, but don’t be fooled. It transforms to 5-3-2, 3-5-2, even to 2-4-4 or 5-5-0 when needed. The mentality is ALWAYS "Balanced". Don't touch it. 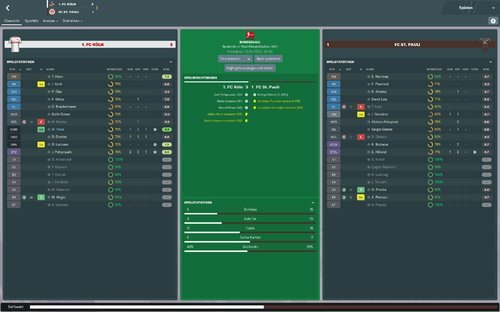 There is a new "Positive" mentality in FM19, but from what I saw, it's too positive and lowers discipline too much. May work for playing against weaker teams, but use it on your own risk. We playing cautions football focused on possession and teamwork. No brainless longballs, we play out of defense with patience. Though we may use direct passes when appropriate or passes into free space if there's an opening. Constants: Width, all Approach Play instructions except Overlap Left/Right, Passing Directness, Creative Freedom. Tweakable: Overlap Left/ Right, all Final Third instructions, Play For Set Pieces, Dribble Less. 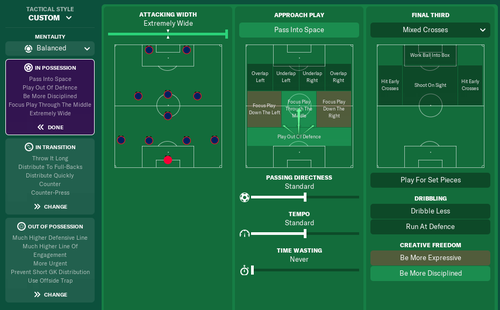 Not recommended to touch: Tempo (tactic itself is quite intense and you’ll just kill your players with the high tempo, though it’s possible to slow down when you in total control of the match), Run At Defense (we play team passing game), Time Wasting (especially!). So, basically, you need to tune cross type, overlapping and long shots/working balls into the box. Using “Play For Set Pieces” is generally not recommended unless you have problems scoring normal way and/or already scored from set pieces. We press opponents as soon as they get the ball and counter-attack quickly. Generally, you don’t need to change anything there. Though you may use “Regroup” if playing vs much stronger team and/or want to play safe. We press high and play offside. Constants: Defensive Width, Prevent Short GK Distribution. Tweakable: Use Offside Trap, Line of Engagement, Defensive Line. Not recommended to touch: Use Tighter Marking, Tackling. Using offside traps and defensive line depends on the quality of your defenders, though tactics work better with high lines. We don’t use global tight marking and hard tackling. Though it’s possible to use easier tackling when you in control of the match and want to prevent any unnecessary suspensions. You should not touch instructions/roles/mentality except for Full-Backs, Ball Winner and Strikers. There are 2 types of instruction sets for those players, more cautious and more attacking. Choosing the right one is depends on the situation. You can found instructions in “player_instructions” directory (they’re loadable from instructions edit dialog). They stay wide, dribble forward and cross a lot. "Attacking Full-Back": going forward often and cross close to the byline. "Cautious Full-Back": playing more carefully (works well with "Hit Early Crosses"). “Ball-Playing Defender”: They obviously defend but may start counter-attacks with through balls and go forward for set-pieces often. Tries to win the ball asap, tackles and presses hard. “Cautious Ball Winner”: stays back, acts more like third center-back/stopper. "Adventurous Ball Winner": goes forward more often, similar to Box-To-Box. “Roaming Playmaker”: team brain. Does anything he wants. “Box-To-Box”: they move all around the pitch, press and tackle hard, helping both with defense and attack. Attacking all-rounders who shoot, pass, cross and press opposition defense. “Complete Forward: default balanced variation. “Pressing Forward”: acts much more aggressive. Stays slightly wider than “Complete Forward”. You don’t need one. This tactic covers (almost) everything. When the team has a ball, it's extremely attacking. When not, it's extremely defending. Use Player/Team Instructions to make it more attacking or defensive. Be creative, use non-standard moves. For example, put center-backs into BBMs positions, turn on Float/Early Crosses from the Deep etc. This tactic is focused on teamwork so it may require some time until it starts to give the best results. Usually, pre-season is enough for the start. Focus on establishing partnerships asap (especially for central defenders). It’s a complex topic and you can read about it here or there, for example. If you have a decent assistant, let him handle this. By default, BWM and BBMs (and “Pressing Forward”) use hard tackling, so be careful. An obvious solution is take off one of the forwards. But if the match is going well, it’s possible to take off BWM, set playmaker role to DLP/Defend and set strikers to Pressing Forward (Defensive Striker). This is particularly useful when you still need to score. As this tactic is quite intensive, a rotation is very important. Generally, you should have two full line-ups. At the start of the season good rotation is 25%-33%, but close to the end of the season, it may require 50% rotation sometimes (packed schedule, important/cup matches etc). It’s important. 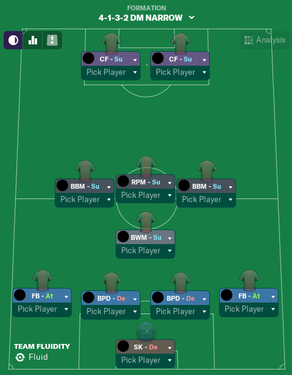 Basic rules are: max size if your team is among the favorites, max width and normal length for midtable teams, min size for relegation candidate. Just ignore him in most cases. 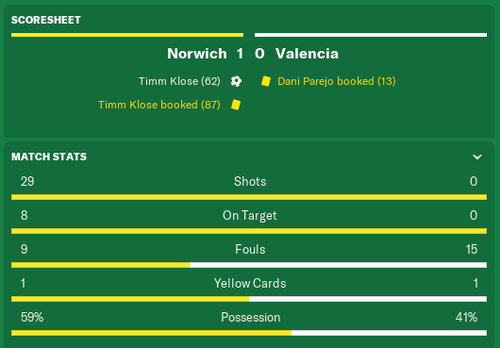 “We being terrible overrun at midfield” and “We need to use more direct passing” when your team is winning 2-0 with 65% possession and opponents have 0 shots on target. 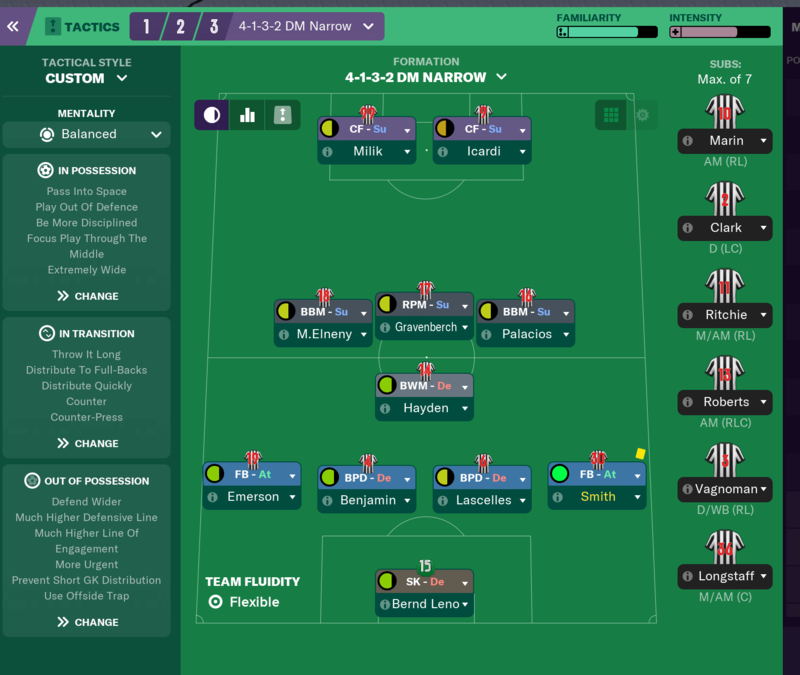 Prior to FM19 most important were teamwork and attacking movements. 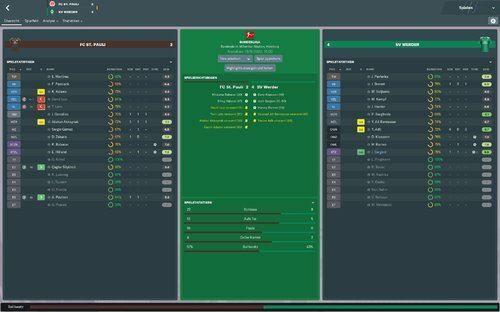 In FM19 training was completely reworked, so no real data on training efficiency exists. To be honest, I’m quite intimidated by the new training and prefer to leave it to the staff for now. Some recommendations may come soon. Don't be harsh. Don't yell. Be calm and motivate. Remember, usually, the team who scores “pep” goal during 46-49 min, wins. Tactic includes some decent set pieces, but you may want to tune them for players you have. The playmaker is default taker (except for throws, full-backs obviously do them). Also, note that offensive set pieces are quite risky with many players going forward. 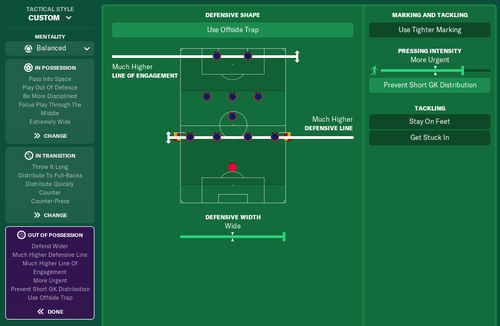 The tactic itself does it very well, but for more safety switch to Defensive Striker and bring on fresh fullbacks (with possible changing them to “Supportive”). Never touch mentality. Consider turning “Work Ball Into Box” on for more possession. Just laugh and move on. You may check how they perform by watching a demo match, first goal especially. Any decent keeper will do. Green circle of “Sweeper Keeper” is not necessary, but don’t touch role. The position where the green circle of BPD is a good indicator. Though generic quality limited defenders may perform well. Fast players with good dribbling and crossing and decent defensive skills. Some wingers may be used there even with a red circle. A defensive midfielder with good technical skills. It’s hard to find a player with a green circle for that role, but DLP usually performs well there. Default set pieces use playmaker as default taker, so consider that. Again, it’s hard to find “green circles” for that role and it’s no guarantee they’ll perform well. Look for MC, DM or DC/DM/MC with well-balanced stats. You may use wingers there if you don’t have other options. * Centre-Backs, Full-backs, and Playmaker are a top priority in that order. ** Should be transfer target #1 due to his skills and versatility. Try to avoid one-footed players. Make exceptions only for VERY good and/or young players (and immediately start developing their weaker foot). Try to avoid midgets, except for full-backs. Height must be 180+cm. Very important attributes: Team Work, Workrate. 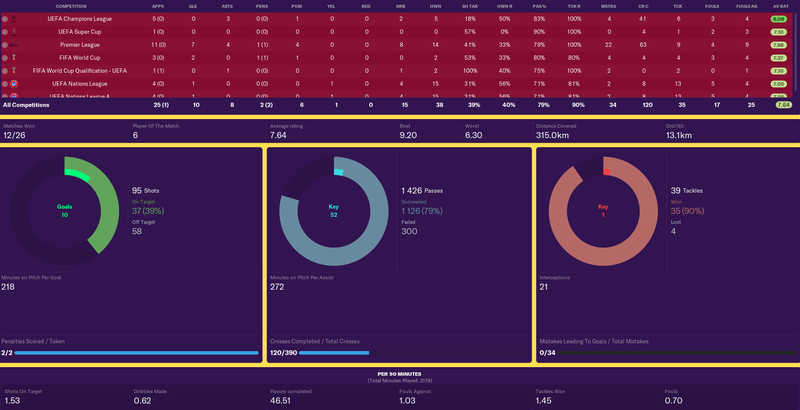 Unpack archive and copy directories “matches”, “tactics”, “player_instructions”, “set pieces” (or select only files you need) to your FM19 directory (usually “C:\Users\[your_name]\Documents\Sports Interactive\Football Manager 2019”). 1) Players on set pieces may behave not like they supposed to do (usually, players with attacking roles stay back). Set pieces rework in 19.1 supposed to fix that problem, but it still may occur. 2) Taker instructions may reset after loading set pieces. This bug is acknowledged so we may expect a fix soon. 2019.1 (Oct-28-2018): First version for FM19. Tested on beta match engine 1900. 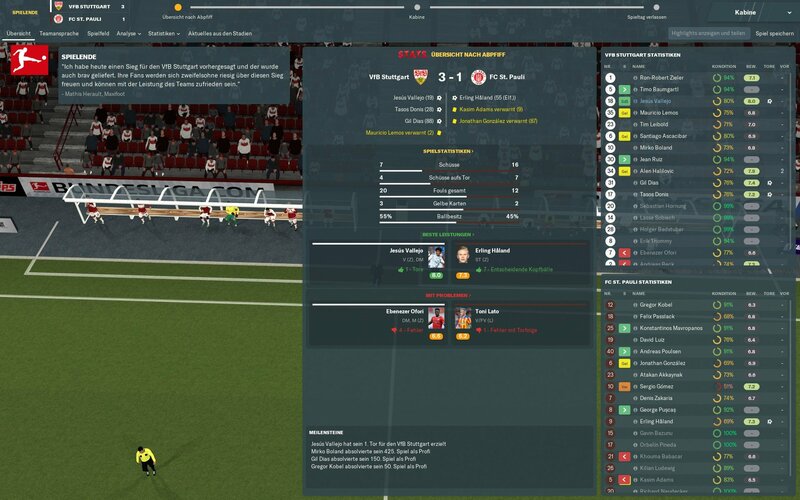 2019.2 (Nov-1-2019): Update for FM19 release. Changes: player instructions (BWM), set pieces, better demo match. Tested with match engine 1913-1914. 2019.3 (Nov-6-2019): Changed attacking corner set pieces (removed bugged role “Mark Keeper”). Edited November 29, 2018 by Xeewaj Q. Actually fluidity does not change with mentality. It all depends on the player roles, for example if you use a supporting DM instead of defending one, you will get a more fluid formation. I think that was the original intention of it in the first place, but most people never got it right, that's why they've made it to automatically tweak when you set the roles. Actually fluidity does not change with mentality. It all depends on the player roles, for example if you use a supporting DM instead of defending one, you will get a more fluid formation. I think that was the original intention of it in the first place, but most people never got it right, that's ﻿﻿why they've made it to automatically tweak when you set the roles. Oh, it makes sense, thank you. I must be blind to not notice. 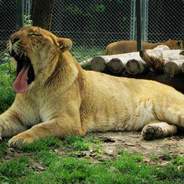 Going to test BWM/Support as a default role. Really appreciate the effort and depth of the tactic. I tried your tactic but I'm not winning and losing, usually a counter attack, any suggestions? Consider turning offside trap off if you losing fast-paced attackers (and dropping defensive line if needed). If it's flank counter-attacks, switching full-backs to "Supportive" may help. Very interesting read and well laid out post. Like the thought process. Might be easier to lay out the player instructions and the differences as the folders are not all there. For instance after downloading I cannot see cautious full back instructions. Have the two versions for BWM and strikers but also a file for for DC, MC GK and a D file! Quite confusing. If you list out the changes people can make the presets themselves. Can be vulnerable to counter-attacks if you have low-quality centre-backs. The mentality is ALWAYS “Balanced”. Don’t touch it. 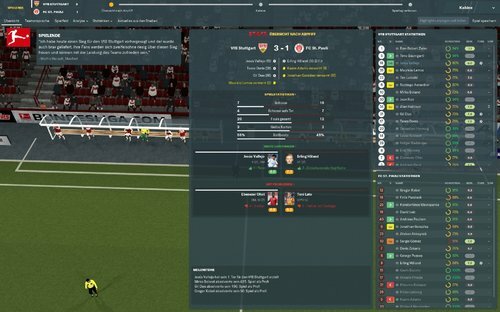 There is a new “Positive” mentality in FM19, but from what I saw, it’s too positive and lowers discipline too much. Use it on your own risk. 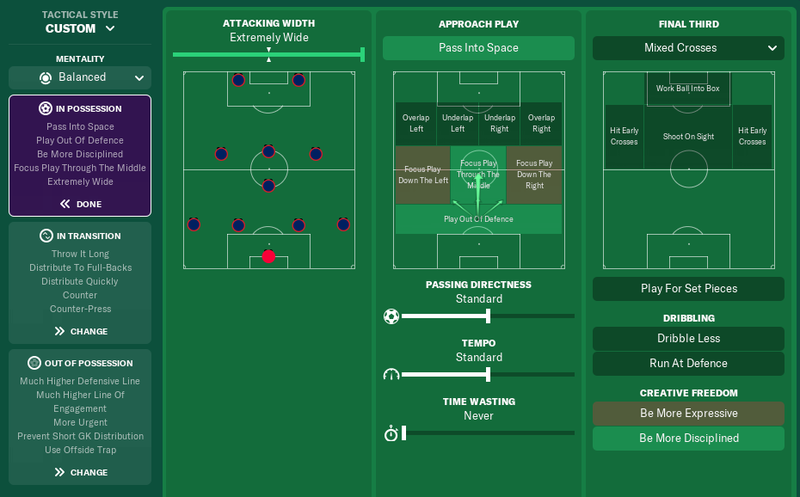 Tweakable: Overlap Left/Right , all Final Third instructions, Play For Set Pieces. Not recommended to touch: Tempo (tactic itself is quite intense and you’ll just kill your players with the high tempo, though it’s possible to slow down when you in total control of the match), Dribbling (we play team passing game), Time Wasting (especially!). Generally, you don’t need to change anything there. You may try “Regroup/Hold Shape/Slow Pace Down” to contain a result, but do it on your own risk, it usually backfires. Best way to contain is score 1-2 more. You should not touch instructions/roles/mentality except for Full-Backs, Ball Winner and Strikers. There are 2 types of instruction sets for those players, more defensive and more supportive/attacking. Choosing right one is depends on the situation. You can found instructions in “player_instructions” directory (they’re loadable from instructions edit dialog). DRL: “Attacking Full-Back” default option and “Cautious Full-Back” for playing safe (end of the match, vs top team etc). 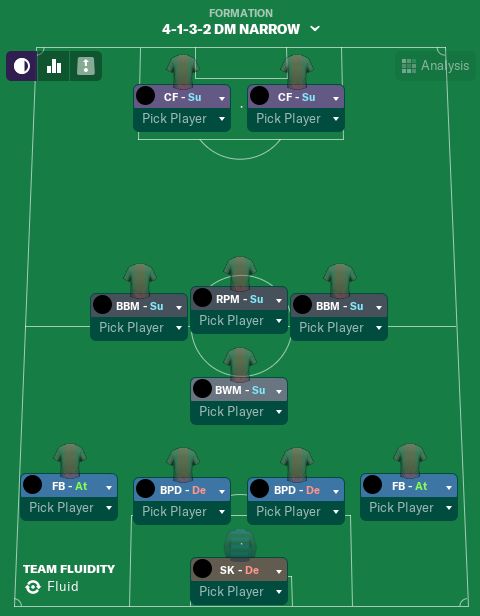 Generally, you only need to select team shape using Full-Backs and Ball Winner presets. You don’t need one. This tactic covers (almost) everything. When the team has a ball, it’s extremely attacking. When not, it’s extremely defending. Use Player/Team Instructions to make it more attacking or defensive. Be creative, use non-standard moves. For example, put centre-backs into BBMs positions, turn on Float/Early Crosses from the Deep etc. An obvious solution is take off one of the forwards. 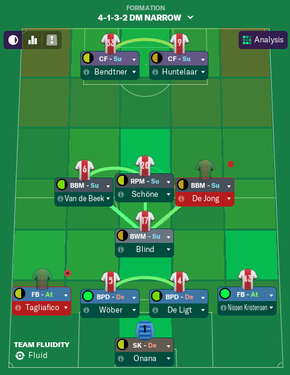 But if the match is going well, it’s possible to take off BWM, set playmaker role to DLP/Defend and optionally set strikers to Pressing Forward (Defensive Striker). 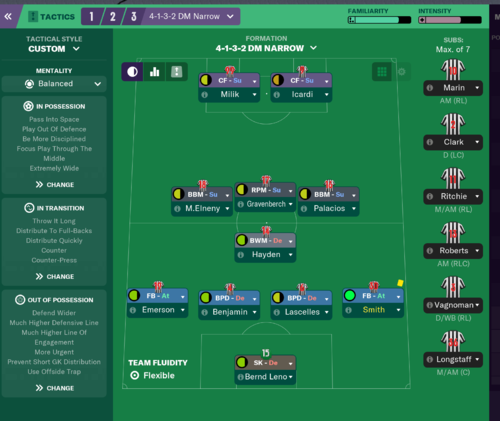 Prior to FM19 most important were teamwork and attacking movements. In FM19 training was completely reworked, so no real data on training efficiency exists. Detailed recommendations coming soon. Don’t be harsh. Don’t yell. Be calm and motivate. Remember: usually, team who scores “pep” goal during 46-49 min, wins. Don’t let the color of suitability circle distract you. Usually, I have only 2-3 players with more or less green circles, the rest are orange/red. Role/duty circle is a good reference, but again, don’t worship it. * Centre-Backs, Full-backs and Playmaker are a top priority in that order. 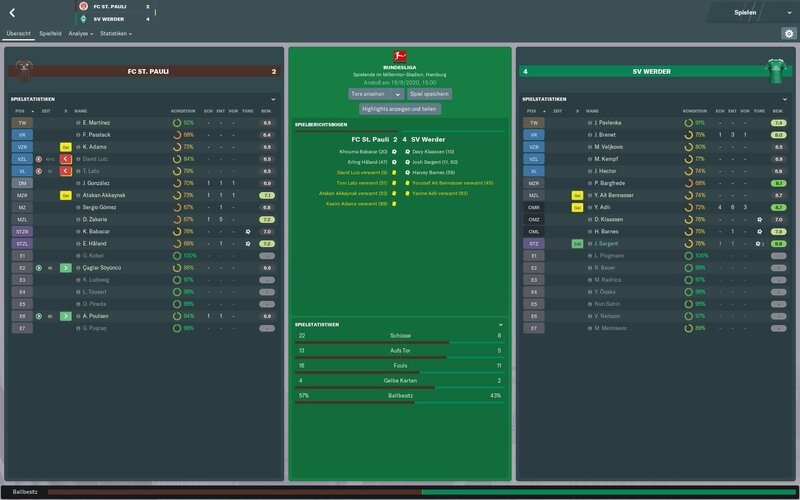 As of FM19 beta, sometimes on set pieces centre-backs and full-backs are switched (i.e. FB goes to the penalty box and CB stays on the flank). This can be dangerous as generally CBs are slower and will have problems to catch counter-attacks. I’ll investigate this issue further after release is out. You used for a role season, only doing some minor changes? 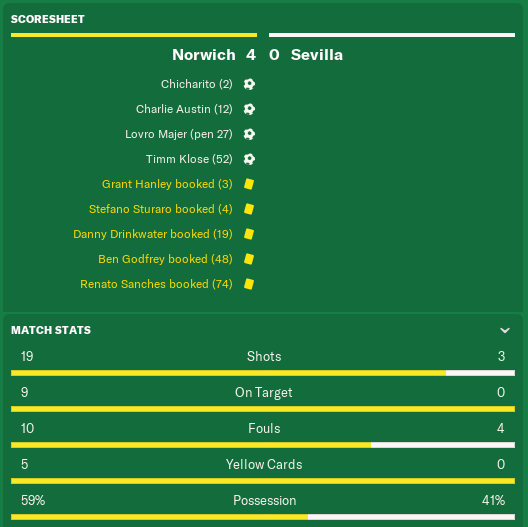 Didn´t the AI cracked your tactic during the season? after downloading I cannot see cautious full back instructions. Understand that but D file empty on my download. Also wondering why there is a GK and MC file with default settings. What are the cautious fullback settings. Can you list them and I will save the preset. Very interesting read and well la﻿id out post. Like the thought process. Might be easier to lay out the pla﻿﻿﻿yer instructions an﻿d the differe﻿﻿﻿﻿﻿﻿﻿﻿nces as the folders are not all there. Those directories are created automatically when you save player instructions. You used for a role seaso﻿n, only doing some minor changes? Didn﻿´t the AI cr﻿acked yo﻿﻿﻿ur tactic﻿﻿﻿ during the season? Sadly, "AI" managers can't do that (yet?). Things are going better and better with increased tactical familiarity and partnership lines. Also, it's not the same tactic every match, I do minor tweakings often. Understand that but D file empty on my download. Also wondering ﻿why there is a GK and MC﻿ file with default settings. What are the cautious fullback settings. Can you list them and I will save the preset. Ajax second (!) line-up (players of 100-120 CA) drew against Barcelona. Conceded only from a corner. 61% possession and more shots/on target vs Messi. It's a friendly, but still, Messi took it very seriously and played 90 min. All I did is a few minor tweaks to the tactics (they all are in that huge text btw). Wonderful tactic so far Xeewaj. Pretty football and good results in fist 5 games with Genoa in Italy. Well done mate. Tinkering with this tactic whilst on Beta (I prefer non-winger set up's) and definitely saw up-turn in results at Hajduk Split in Croatia. See what you mean though, best CB's you can get with some tinkering when facing counter attack. Nice tactic @Xeewaj Q. Thanks. They are there. They just can’t be seen by the game so have saved them manually. Thanks anyway. One of the pros is that is plug and play but requires minimal tweaking for relegation candidates. Which are these tweaks? Also you say that dealing with the 442 and the variants of it can be tricky but I can't seem to find what you recommend to do when coming up against them? Tweaks depend on players you have. Basically, you need to select optimal defensive line and check if your centre-backs are capable of playing offside. Also, consider "Dribble Less", "Regroup" instead of "Counter-Press", "Hit Early Crosses" + "Supportive Full-Back" as default. As for 4-4-2, it depends on the situation. 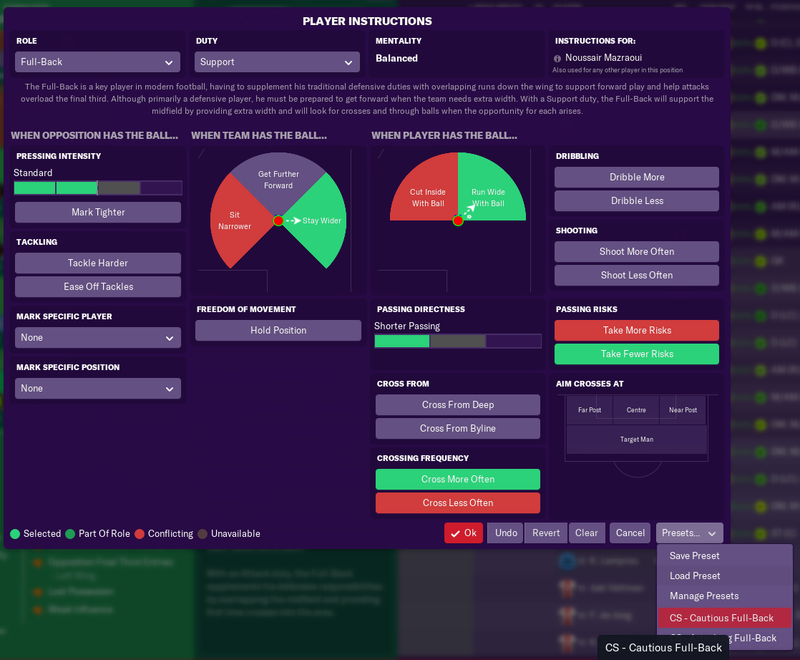 It may require no changes, but generally, I prefer to use pressing forwards instead of complete ones there ("Defensive Striker" preset as of 2019.1). 19.1 introduced changes to set-pieces, so they are most likely crippled now. Reloading from preset will not help, but at least check them as they may be completely random. Update coming soon after release. Tested with match engine 1913-1914. This is a critical update 'cause of set pieces rework in 19.1. Can I just save the tactic file and everything will be done in terms of player instructions etc. and then apply whatever set pieces I want? Yes, you can. 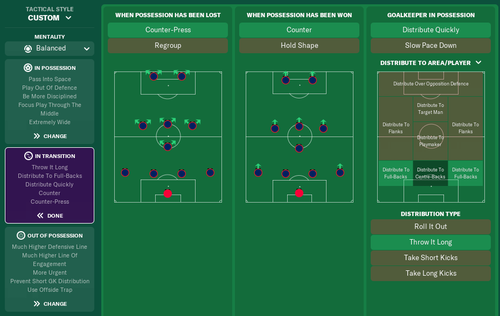 Tactic includes everything, set pieces/player instructions provided as a backup or for tweaking. Modified attacking corner set pieces (removed bugged role “Mark Keeper”). This is a more or less required update unless you already fixed attacking corners yourself. Interesting read, really well thought out and presented. 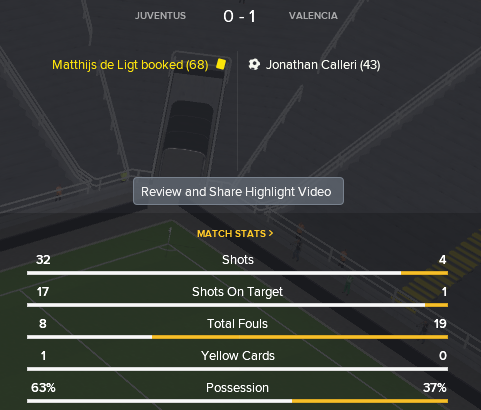 Started using this tactic last night with my promoted Venezia in Serie A. It's been tough! 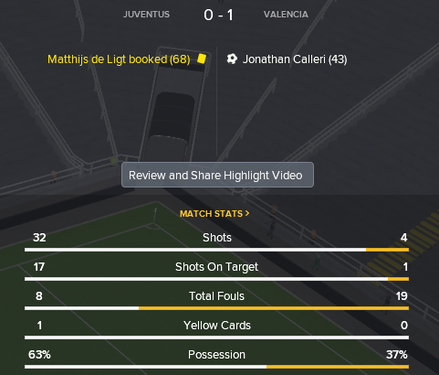 Some promising results though, drew 1-1 with Roma at home. 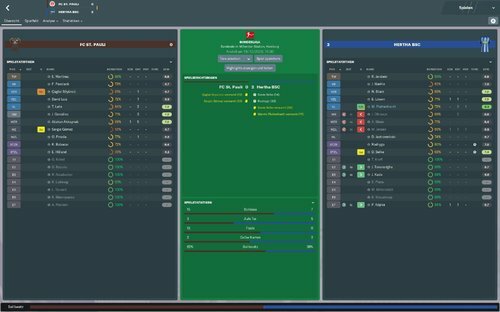 Drew 2-2 with Cagliari away, 0-0 away at Bologna. 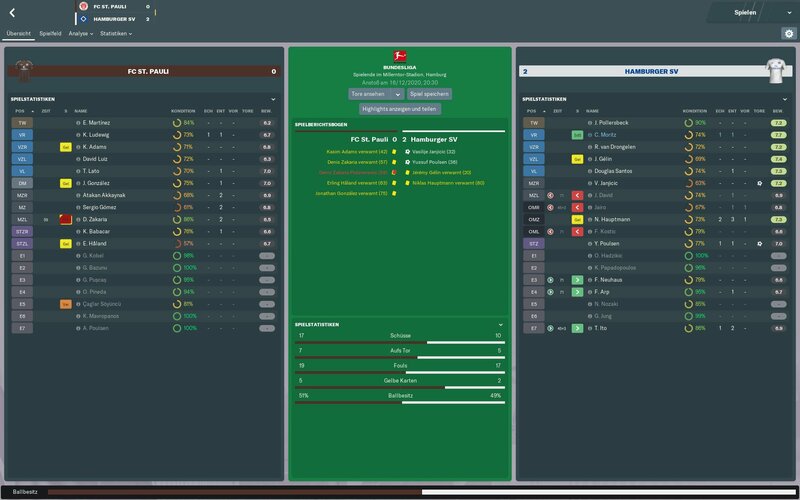 Went 3-1 up (HT) away from home at Pep Guardiola's Napoli; only to lose 5-3 with 2 late penalties given away. 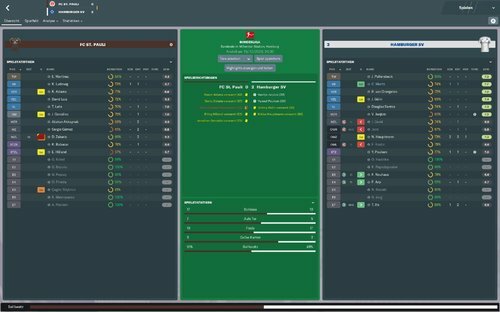 Lost at home against Atalanta after going 2-0 up, finished 3-2. 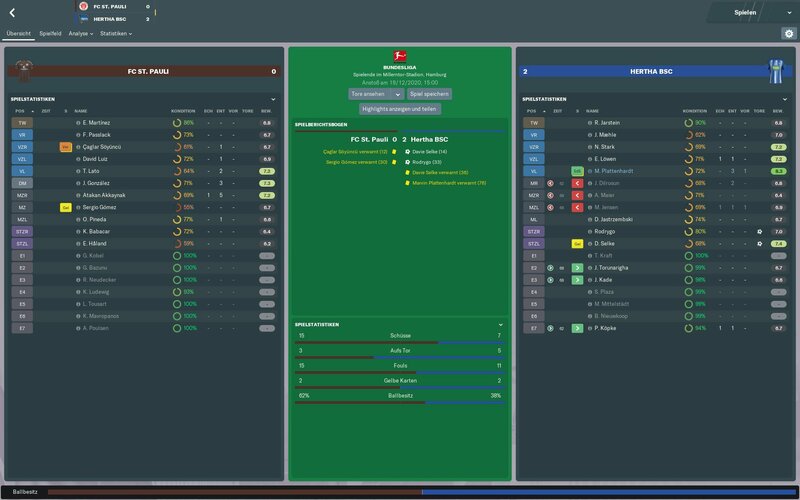 Last match beat Sampdoria 4-1 at home. 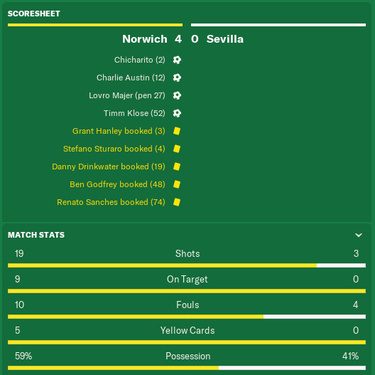 I would say we've generally been better since using this tactic, I've been fiddling with the defensive line and removed offside trap a few times. Frustrated at throwing away good leads, any tips? Thanks for uploading though, looks promising. Playing as just promoted team vs giants can be really tough and sometimes nothing can be done 'cause CA difference is too big (situation when your player behave like mindless dolls). But generally, it's possible. You need to limit opposition from taking any shots on target. It can be done with more careful play + setting right opposition instructions (check links in the text). If doing right, you may play well vs team whose one backup player costs more than your total line-up. 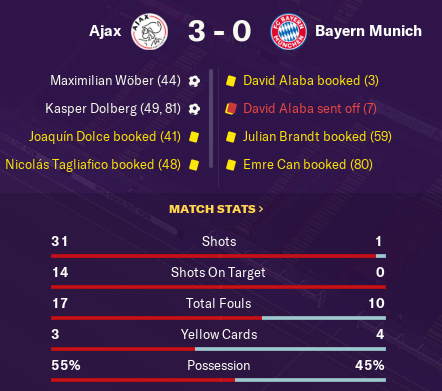 (Even with a man down Bayern has much more total CA). But again, it's a teamwork tactic, so give your players some time to get maximum familiarity and establish partnerships. They'll play better then. Also, the match engine is quite raw ATM. Defending vs high longballs through the middle is very sloppy now. Dealing vs counter-attacks too (when 4-5 players chase someone on the flank and leave penalty area absolutely empty). Pressing, wideness issues etc. It should be sorted with 19.2-19.3, I hope. Edited November 14, 2018 by Xeewaj Q. Many thanks for the help, I have been using early crosses and I think regroup might be an option too. I will let you know how I get on, I'm poor little Venezia trying to mix it with the big boys so I'm not expecting miracles! These high balls over the top very frustrating. Do you ever move the defensive line and line of engagement? Usually, I keep both lines as high as possible. But those balls clearly is a match engine issue: center-backs are slowly moving back until the attacker is few meters ahead. Dropping the defensive line may help, also as a temporary solution for underdogs turning off offside may be an option. Personal marking opposition striker with BWM worth trying too. This is an excellent system and enjoying using it and tinkering. Full backs often have their crosses blocked and whipped crosses or early ones doesn’t seem to prevent. Might try going narrower. Also when chasing a goal or being more adventurous I try overlap left and right, be more expressive, more direct passing as well as making sure FBs BWM and CFs on the right instructions. Full backs often have their crosses blocked and whipped crosses or early ones doesn’t seem to prevent. It's the match engine issue introduces with ME 1914 (19.1.2) - full-backs often dwell on the ball instead of crossing. Should be fixed in future patches, I hope. I rarely do anything except what is written in the description. Overlaps - yes, sometimes. Turning off "disciplined": never. Passing is untouchable too, the only player with direct passing is a playmaker. The rest depends on the situation, it's usually finding right "Final Third" instructions combination and personal orders for strikers, BWM and fullbacks. 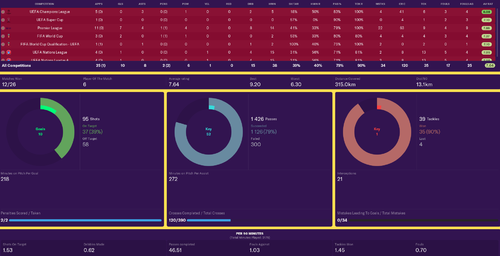 Any help really appreciated...stats always look amazing, but opponent scores with every shot on target. Could post far more stats like this. Doesn't matter whether I'm favourite or underdog. How do you concede the goals? If it's high longball through the center when your defs are petrified, try to turn off the offside trap, it's heavily broken ATM. On the other hand they just can't score. Yes, yellows are quite common 'cause BWM and BBMs use hard tackling by default (we shoo opposition from the middle). As for set pieces, a significant part of conceded goals comes from them. Though I score at least the same amount from set pieces. It's probably match engine issue 'cause once I saw 167cm winger won header vs 196cm keeper. Your team got a decent number of shots, you should score more. Maybe your strikers are on goal droughts? Then midfielders should score instead. Try a safer way. For example, no offside, deeper defensive line, regroup, work ball into box, low crosses, dribble less, cautious full-backs. Maybe slower tempo and shorter passing. Even global tighter marking worth trying if they still get a decent number of shots. If you playing vs a team with a single pacy striker, consider personal marking him with BBM. If nothing help, then I really don't know, sorry. When lowering the defensive line do you also lower line of engagement. This has been working well for me. Also trying on occasion to reduce defensive width as this can help shore up the centre from attacks down the centre and force their play wide and hope my decent centre backs jump and deal with the crosses. Also trying on occasion to reduce defensive width as this can help shore up the centre from attacks down the centre and forc﻿e their play wid﻿﻿e and hope my decent centre backs jump and deal with the crosses. Yes, dropping line of engagement makes sense, but I never drop it below "Standard". As for width, "Extremely Wide" is a constant, I never change it. 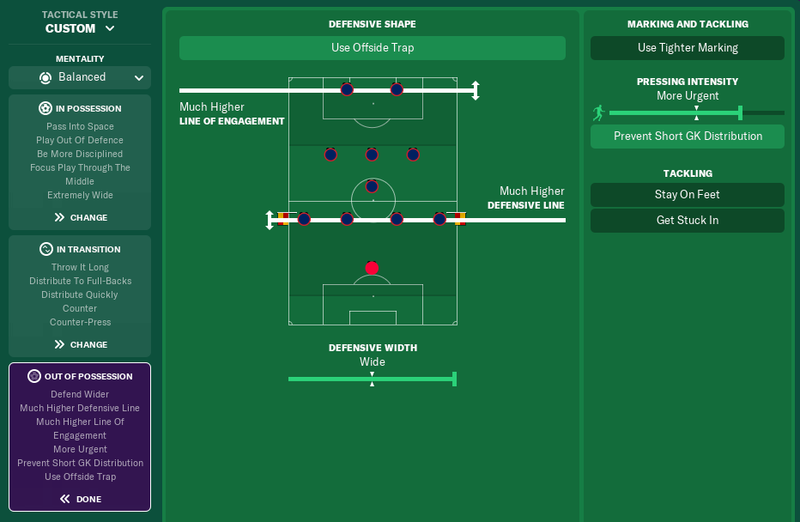 When defending vs possession attacks, there should be about 5-6 players in the middle (center-backs, BWM, BBM, possible playmaker) and +2 more if you use defensive strikers. 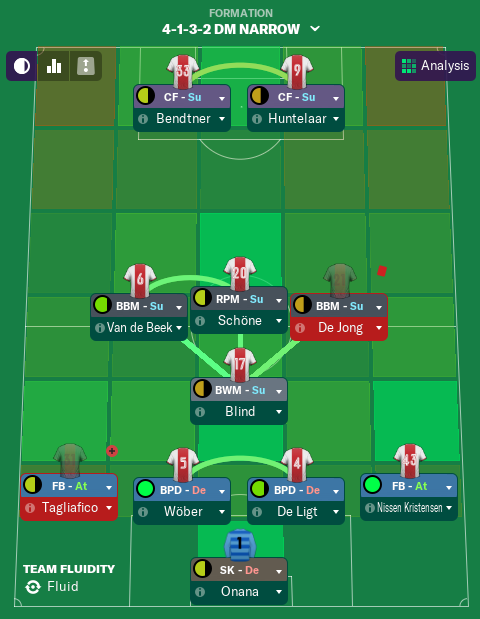 Full-backs should stay as wide as possible (crosses are broken ATM, but most likely they'll become dangerous again with 19.2), But if it works for you, why not. Ok. Many thanks for response. Another question. When looking for a roaming playmaker what are the key attributes for you? Passing, Technique, Vision, Composure, Decisions, Consistency (hidden, scout player until you get a clear idea of his consistency, i.e. "(fairly) consistent performer"). Flair, Workrate, Teamwork and all set piece attributes (except throws) are preferable. Edit: screenshots are from 2022/2023 in-game year, so his starting stats are a bit lower of course, but performance still great. Edited November 27, 2018 by Xeewaj Q. That's a great idea. I'll include them in the next tactic update (after 19.2 release), ok? Many thanks. Had already scouted Mr Majer. He is going to be exceptional. Won’t get him to join my newly promoted team in the Championship. Was looking at similar stats which is encouraging. Ended up with Cameron Brannagan which is good for expected level in the Championship. Look forward to the filters. Weird. Reuploaded the archive, now downloading works again.